Japanese Episode AG 122: "Kaimaku! Gurando Fesutibaru (1)!!" American Episode 392: "Hi Ho Silver Wind!" Haruka has arrived in Kaina City, home of the Grand Festival! After registering her pokemon and five ribbons, Haruka is approached by her mother, who came along to watch her daughter compete! Haruka also runs across Shuu, who wishes her good luck, and Harley, who apologizes for his earlier actions and promises that he's a changed man. Meanwhile, the Rocket-Dan have also arrived in town, taking advantage of Senri's popularity by having Kojirou dress up as the Touka City Gym Leader. The Rocket trio promise to give the gathered Coordinators' pokemon special training from Senri himself, but the room where they take the pokemon is really one where the pokemon are put in cages! Eventually, the Rocket-Dan are confronted by Satoshi-tachi, who call them out for the frauds they are. Haruka and Satoshi combine their pokemon's power to stop the Rocket-Dan and send them blasting off, saving all the pokemon they had kidnapped. Soon after, the Grand Festival preliminaries start! Only 64 trainers will be chosen to compete in the Appeals round, so Haruka tries to best to beat the odds and come out on top. The results are announced, and Haruka, Shuu, and Harley have all made it to the next round! Now that the Grand Festival is officially underway, Haruka wonders which of her rivals she'll fight first! It's Grand Festival time! This three episode tournament is really good, and the anime writers seemed to have learned from the Jouto League how to better pace a major tournament like this. This episode, in particular, was great because of all the references to Haruka's previous competitors, the return of Robert (from way back in AG 035), the return of Kojirou's Senri disguise, Haruka's mom, and, of course, Harley. It seems like the writers really pulled out all the stops to remind us that Haruka wouldn't have gotten this far without all her experiences, something I wish they'd do more with Satoshi every now and then. 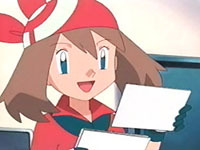 In Japan, this episode aired as part of a two-hour special that also included parts two and three of the Grand Festival in addition to a 30-minute special about Myuu and the Wave-Guiding Hero, Lucario and the Pokemon theme park in Nagoya. The dubbed version doesn't edit out Jynx, so there's hope for those skipped Contest episodes yet. The only other thing worth pointing out is that 4Kids seems to REALLY love Harley, a character who makes James look like a raging heterosexual. I mean, did you hear Harley call Haruka "girlfriend" right before the Trainer's Choice commercial break? HILARIOUS. The episode's title screen is shortened by two seconds. The shot immediately following the title screen is shortened by about one second. Later, after the Trainer's Choice commercial break, a second is trimmed from the shot after. Red-haired girl: "That's my Espeon in that cage!" Green-shirted man: "And my Zigzagoon!" Older man: "That's certainly not my idea of special training!" Originally, the third man was saying something like "Give back my Rougela!" implying that the Rougela we see in that cage is his. So, was this a purposeful change to avoid mentioning Jynx, or was this just a random dialogue edit that doesn't really mean anything but will be dissected by fans anyway? The TO BE CONTINUED... screen is shortened by a second.